The intact stern of the Sweepstakes, a shipwreck in Big Tub Harbour in the popular Fathom Five National Marine Park, Lake Huron, Ontario, Canada. Said to be in top shape after over a century underwater in Big Tub Harbour, the shipwreck Sweepstakes hull is intact from the bow to its stern. 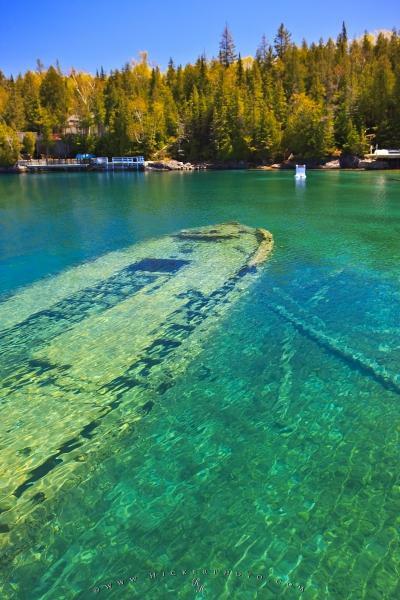 A popular diving destination for is Big Tub Harbour in the Fathom Five National Marine Park, the site of Sweepstakes shipwreck. Photo of the stern of the shipwreck Sweepstakes in Big Tub Harbour.